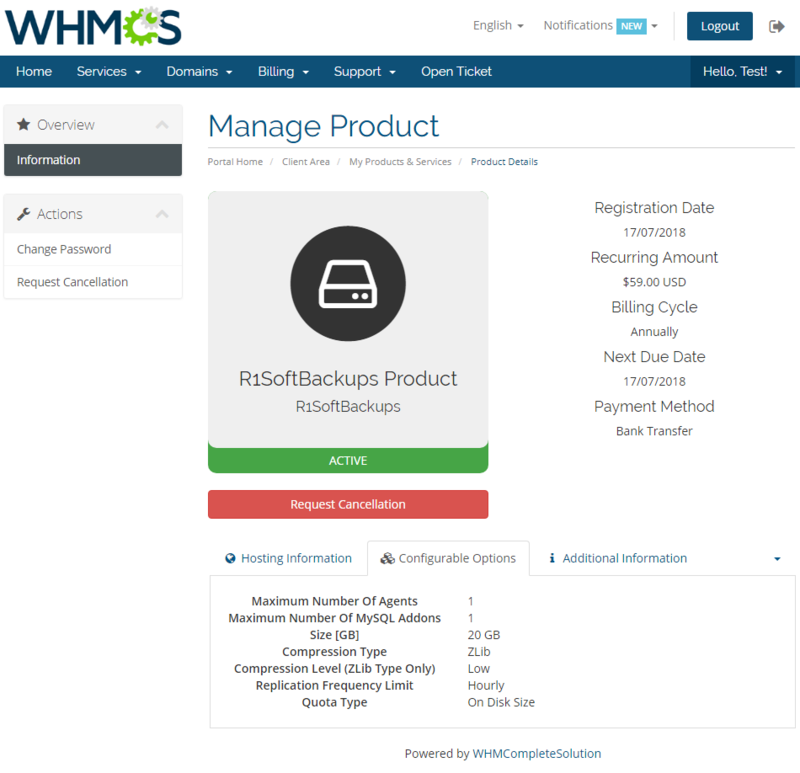 R1Soft Backups For WHMCS will let you sell and manage R1Soft Server Backup Manager accounts right in your WHMCS system. Your customers will be able to use different configurable options in order to adjust their products to satisfy all their needs. Moreover, they will be allowed to monitor the disk usage, choose its compression type and access the control panel with a single click. 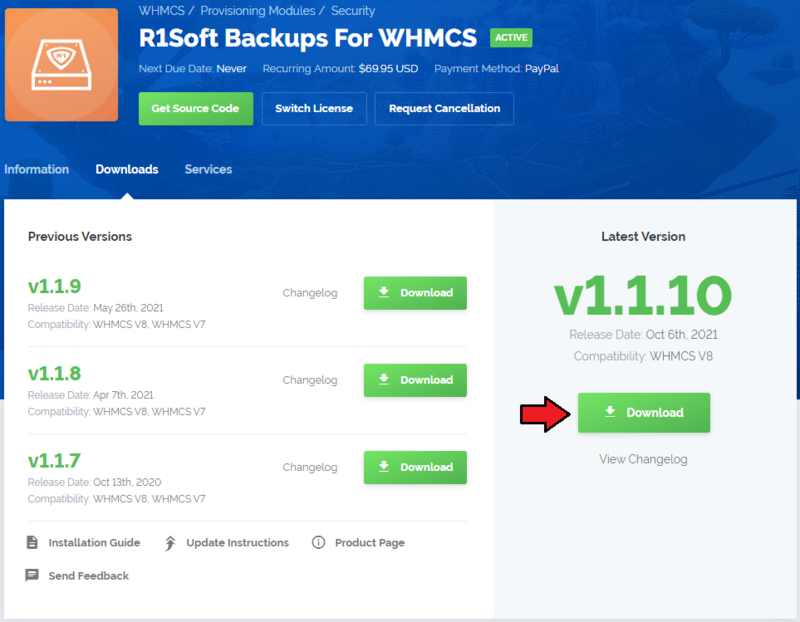 This tutorial will show you how to successfully install and configure R1Soft Backups For WHMCS. 4. When you install R1Soft Backups For WHMCS for the first time you have to rename 'license_RENAME.php' file. File is located in 'modules/servers/R1SoftBackups/license_RENAME.php'. Rename it from 'license_RENAME.php' to 'license.php'. 6. 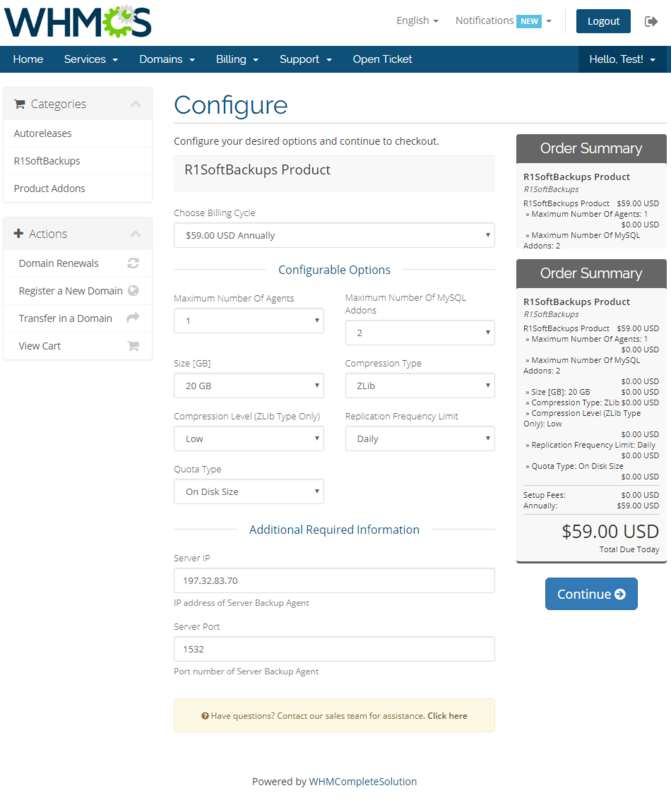 Now, we will show you how to configure a new product. 7. Next, enter your server name, IP address/hostname, username and password. Choose 'R1softbackup' from a dropdown menu and press 'Save Changes'. Note: Here you may also provide your custom port to connect with your server. 8. It is time to create a server group. To do so, click on 'Create Server Group'. 9. Enter name, click on your previously created server, press 'Add' and afterwards 'Save Changes'. 10. In order to create and configure a product, go to 'Setup' → 'Products/Services' → 'Products/Services'. 11. 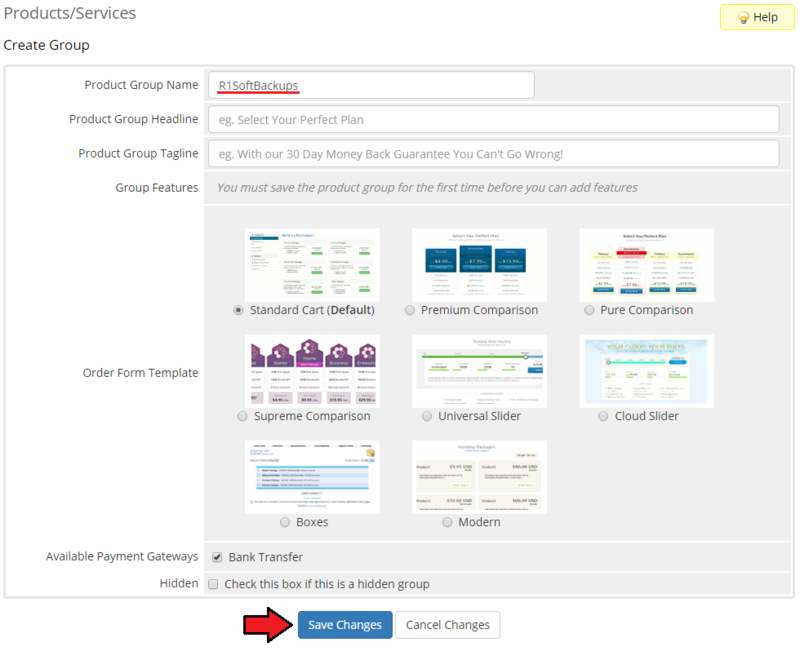 Enter product group name and press 'Save Changes'. 13. Afterwards, choose your product group and type from dropdown menus, enter your product name and press 'Continue'. 14. 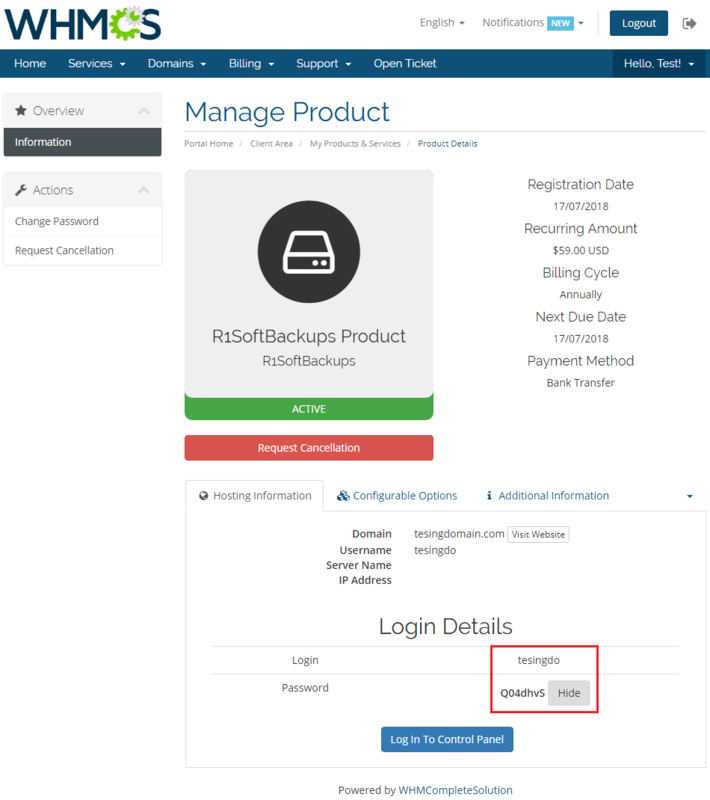 Now, go to 'Module Settings' section, choose both 'R1softbackups' and your previously created server group from dropdown menus. First of all, you need to enable Power-User as only then you will be able to manage Module Settings fully. Remember to save the changes in the end. Use 'Generate' buttons to automatically generate custom fields and configurable options for the product. 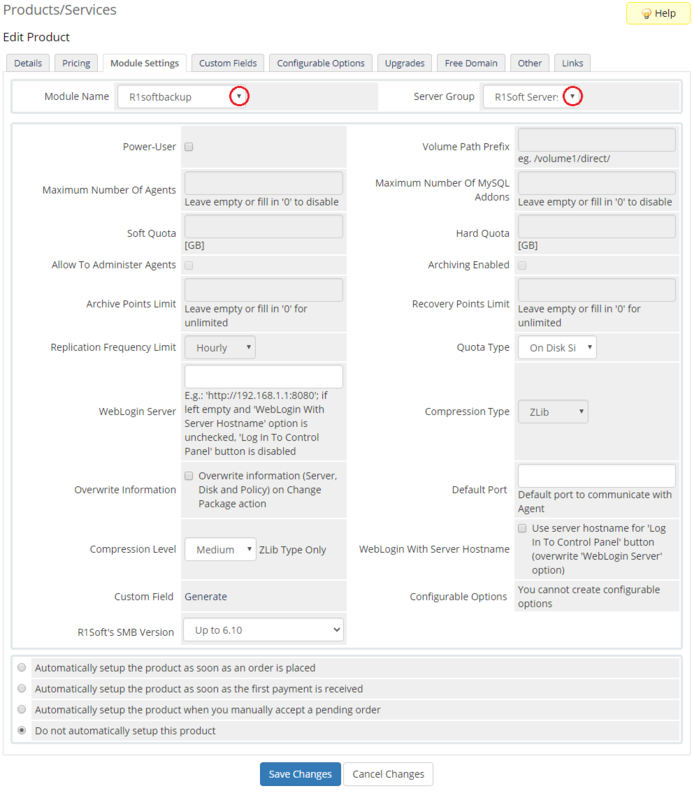 Note: It is recommended to edit configurable options to suit your needs, more about management of configurable options can be found here. 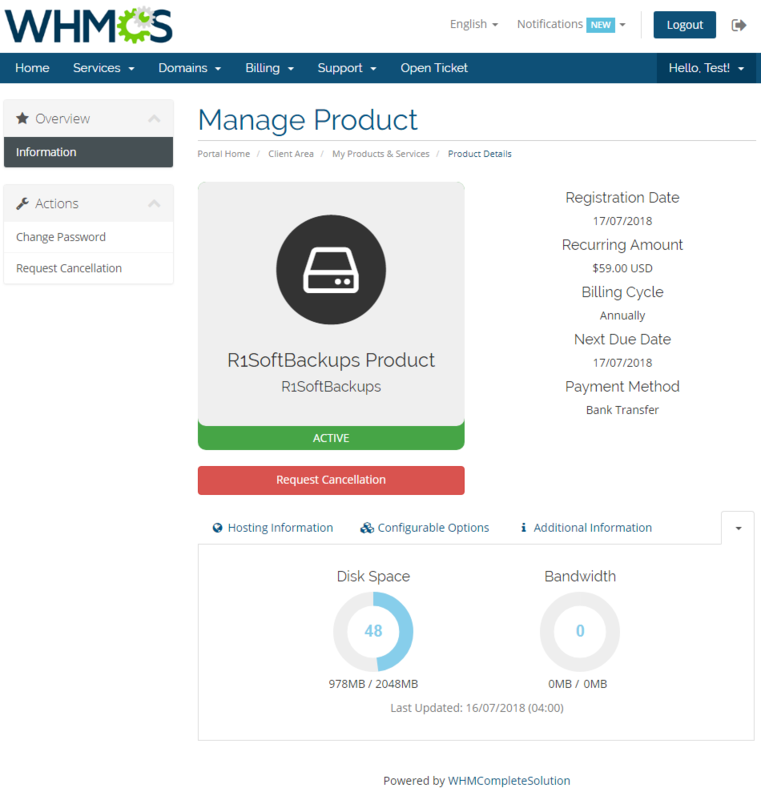 R1Soft Backups For WHMCS allows reselling and accessing an external backups management server directly from your WHMCS. Read the below section to find out how contributing the product can be to your business. 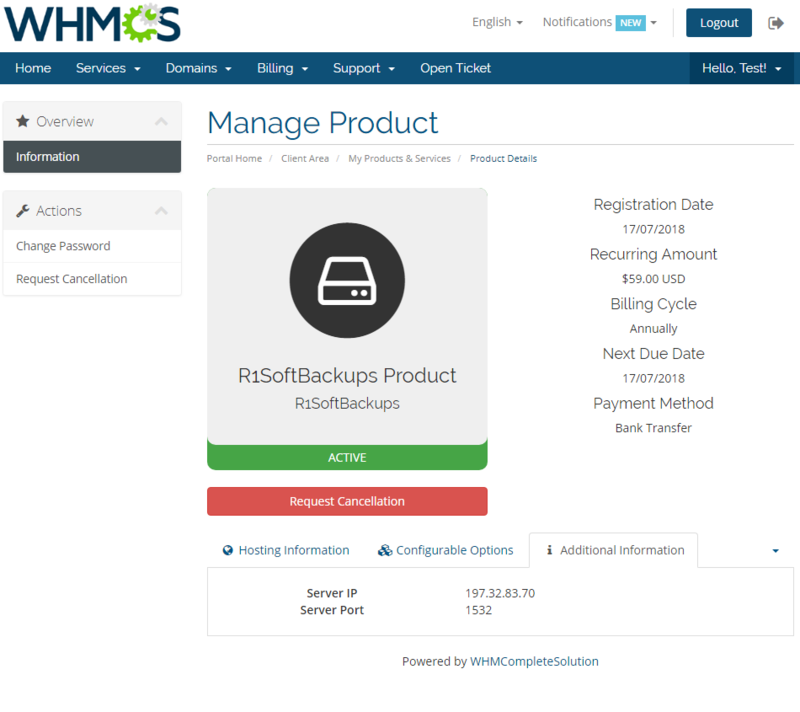 R1Soft Backups For WHMCS is ordered by clients as any other product. However, there is one thing to pay attention to. Server IP - this is an IP address of Backup Manager agent's server. Server Port - defined port number used to connect to server of Backup Manager agent - unless otherwise configured by the administrator. 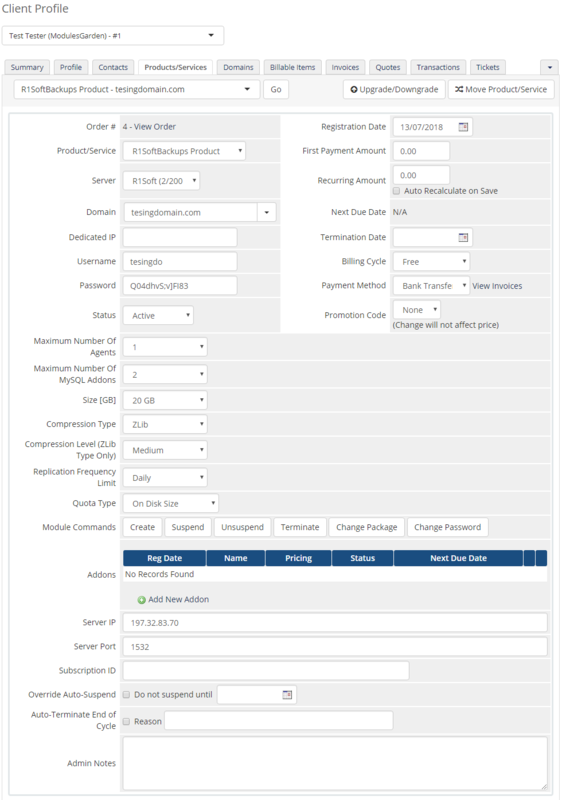 Additionally, depending on configurable option, client can define account limits. 'Create', 'Suspend', 'Unsuspend', 'Terminate', 'Change Package' and 'Change Password'. Underneath the buttons, there are also 'Server IP' and 'Server Port' details available. 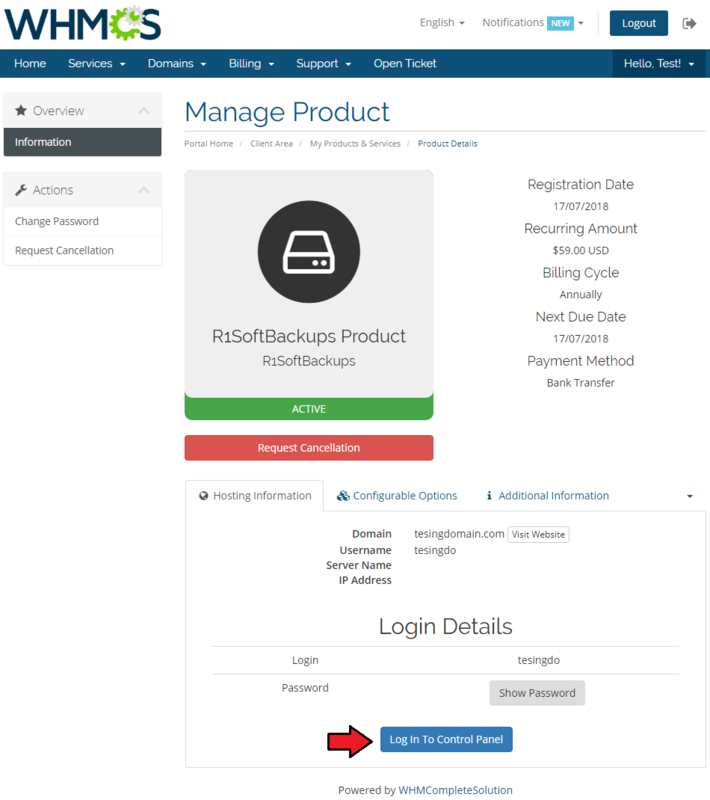 Your client can log in to the outside R1Soft account from your WHMCS client area. Link to the server must have been entered in Module Settings (look at point 14 for more information). Apart from the direct login button, there are also 'Login Details'. View your R1Soft server login and show/hide password. 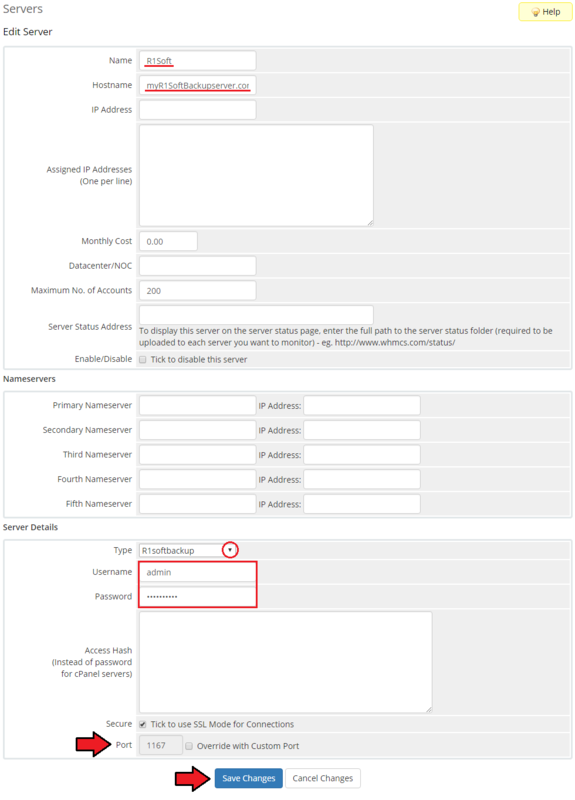 Quick look at your product details, as stated while placing an order at Configurable Options section. In Additional Information section, you may preview defined Server IP and Port. Resource Usage includes a graph that displays information on the currently used disk space. Note: Bandwitdh graph is a WHMCS option and is not managed by the module. 1. 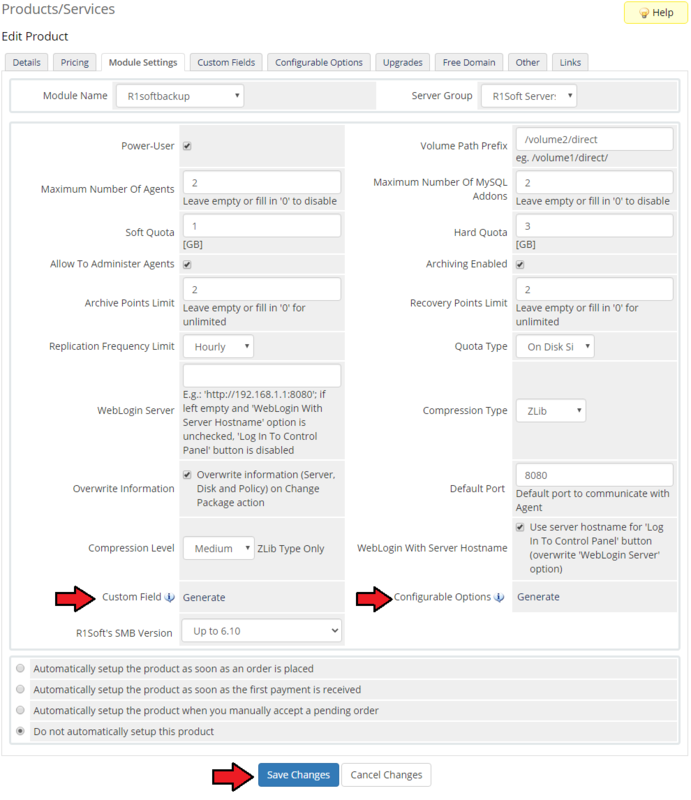 If you do not want your clients to provide a backup agent port, then modify according custom field and define default port to communicate with agent in Module Settings. This page was last modified on 18 March 2019, at 15:48.